A garden of goodness. It's a principle as old as nature itself. Birds, you see, are intuitively attracted to what's good for them. Much to the irritation of any farmer or weekend gardener, they're especially attracted to certain vegetables. Why? Birds know a good thing when they see it, touch it and taste it. 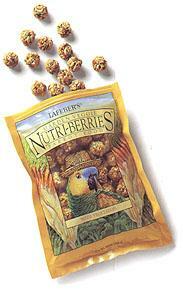 Garden Veggie Nutri-Berries are chock full of good things for your bird. Wholesome, inviting vegetables like carrots, green peas, broccoli and corn, together with other nourishing ingredients like safflower, red millet and hulled oats. They're all rolled into an inviting berry shape that birds find irresistible. So irresistible, in fact, that 96% of the berry gets eaten. Made even better. More than just healthy vegetables, Garden Veggie Nutri Berries are designed to be a 100% nutritionally complete meal. They provide your pet with all 40 nutrients recommended by Dr. T.J. Lafeber as being essential to a bird's health. Nutrition that's vital for a bird to maintain a lustrous appearance, peak vitality and a playful disposition. Garden Veggie Nutri-Berries. Because birds know what's good for them.